NEW P A I N T I N G ! In September, Cheri and I drove through the old ghost town of Molson Washington. 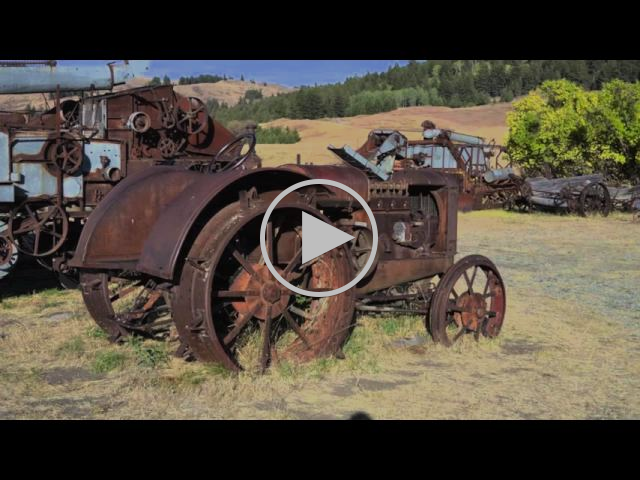 The area is rich in rusty treasure but the one item that stood out above all else was the remains of this 1902 Case Steam Tractor. At rest looking out over the fields it once toiled, it still commands an impressive presence. One glance at machinery like this reminds us the daily challenges many of our grandparents went through to create a life for their families. This location is a stone throw from Osoyoos BC, in the Okanagan Valley. Cheri and I had just crossed the US border and thought we would drive out to the old ghost town, as the late afternoon was upon us and that magic hour of light was just starting. The drive from Osoyoos to Molson Washington is a gorgeous and very scenic windy back road. We had the entire town to ourselves as there was not a soul around that we could see, but it is a ghost town after all so who truly knows? As we started exploring the area we immediately noticed this 1902 Case steam tractor sitting off to the side. From the large exposed gears to the massive spoke steel wheels, it is impossible to not appreciate both the machine, and the people that designed and built it. It must have been a true sight to behold one of these tractors hard at work at the turn of the 20th century. I love painting this region and the vehicles I find in it. There is a different quality to the way they rust, leaving a very dry and weathered patina with the absence of moss and the heavy deterioration that we find closer to the coast. I am really captured by these various textures and earthy colours, and also like how the old weathered wood creates a nice contrast alongside the rust. 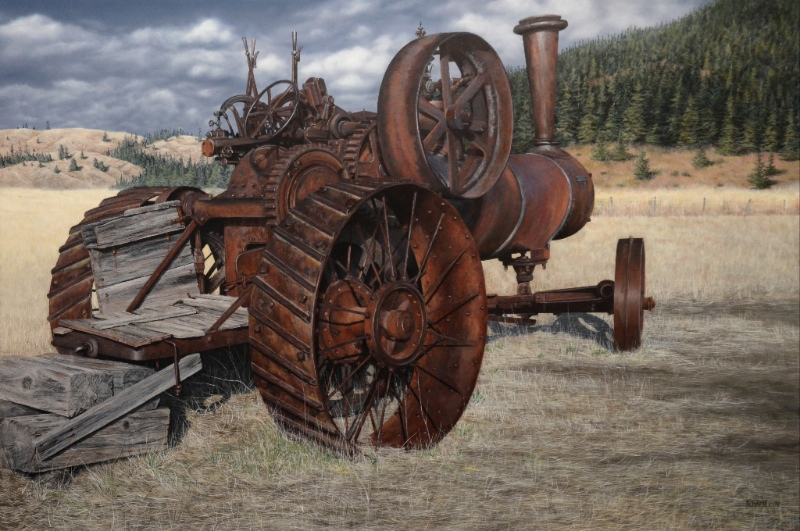 This painting has been one of my bigger challenges to date, as capturing all the machinery of this tractor in its proper perspective required constant vigilance. As challenging as a subject like this is to paint, the background or environment requires just as much focus and attention to make us believe the painting as a whole. Our trip to this area was full of inspiration but I knew the moment I saw this tractor that it would make its way onto my canvas without hesitation. If you are interested in seeing the painting in person or would like to find out more information about its availability please feel free to contact us at neilhamelin@gmail.com or by phone at (778) 388-8394. A short video from our trip…..